Brian Duffy (left) and Scott Parazynski will be inducted into the U.S. Astronaut Hall of Fame as the class of 2016 in May. 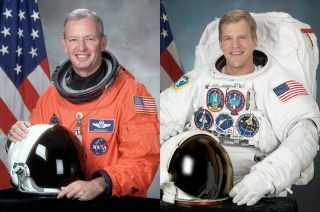 The commander of the 100th space shuttle mission and a spacewalker who summited Mount Everest will both be honored with their induction into the U.S. Astronaut Hall of Fame, officials announced on Monday (Feb. 1). Former NASA astronauts Brian Duffy and Scott Parazynski will be honored as the Hall's 2016 class of inductees on May 14 at NASA's Kennedy Space Center Visitor Complex in Florida. A public ceremony will be held under the display of the retired space shuttle Atlantis. Both men flew aboard the orbiter during their spaceflight careers. Combined, Duffy and Parazynski launched on nine shuttle missions between the years of 1992 and 2007, conducting science, deploying satellites, and visiting Russia's Mir and the International Space Station. "Being selected to be in the Hall of Fame is just absolutely beyond belief," Duffy said Monday, after being announced as one of this year's inductees. "I am so thankful for being honored for doing what I love, doing what I wanted to do. It is a surprise, but a very welcome surprise for me." "As Brian said, this is an incredibly exciting and humbling honor. Certainly one of the greatest honors of my life," said Parazynski. STS-92 commander Brian Duffy adds the patch for the 100th space shuttle mission to the International Space Station's wall in 2000. Duffy, who was chosen with NASA's 11th astronaut group in 1985, logged more than 40 days in space in the course of flying four missions. On his first two shuttle flights, STS-45 in 1992 and STS-57 in 1993, he served as the pilot of Atlantis and Endeavour on missions to study the effects of the Sun on the Earth's atmosphere and to work on the first commercially-developed Spacehab module. Duffy commanded his second two flights. He led the STS-72 crew on Endeavour to retrieve a Japanese microgravity research spacecraft from orbit in 1996, and then four years later, helmed Discovery for the STS-92 mission to continue assembly of the International Space Station. The latter mission, which delivered and installed a docking port and a segment of the orbital outpost's backbone truss, marked the 100th flight of the shuttle out of the program's eventual 135 total. Leaving NASA in 2001, Duffy, a retired colonel in the U.S. Air Force, worked on space projects for Lockheed Martin before joining Orbital ATK in 2011, where he today serves as vice president and Johnson Space Center manager for exploration systems. Duffy is also the executive director of the Coalition for Deep Space Exploration, a collaboration between several U.S. aerospace companies. "I'm very proud of having been part of the past, but it's also great looking forward. The space station is actually the first step in our journey to deep space exploration," said Duffy. Parazynski joined NASA's ranks in 1992 as a member of the 14th class of U.S. astronaut candidates. A veteran of five shuttle flights, he logged more than 57 days in space, including almost 50 hours on seven spacewalks. Like Duffy, Parazynski's first spaceflight, STS-66 in 1994, was on a mission dedicated to the Atmospheric Laboratory for Applications and Science (ATLAS), continuing studies of the Sun's influence on Earth. Three years later, he again launched on Atlantis on STS-86, the seventh space shuttle mission to dock with the Russian space station Mir. Parazynski's third flight, STS-95 in 1998, was highlighted by the presence of 77-year-old original Mercury astronaut John Glenn making his return to orbit on board Discovery. "It was a real thrill of a lifetime to fly with my boyhood hero. Kind of a high stress environment too; didn't want anything to happen to the good Senator," said Parazynski. Parazynski then launched on Endeavour to help install the Canadarm2 robotic arm on the International Space Station as a member of the STS-100 crew in 2001. A medical doctor by education, Parazynski had to perform emergency surgery on a torn space station solar array on his fifth and final flight, STS-120 in 2007. The array, which Parazynski helped to relocate from the Z1 truss that Duffy earlier delivered to the station, became snagged as it was being redeployed. Parazynski used make-shift cufflinks to successfully secure the tear in the array. "I certainly consider that solar array repair as my best day on the job ever," said Parazynski. After leaving NASA's astronaut corps in 2009, Parazynski joined the faculty at Arizona State University and founded a human performance program with the Mayo Clinic. He previously served as chairman of the board of directors of the Challenger Center, helping to inspire 400,000 students and teachers annually. On May 19, 2009, Parazynski became the first astronaut to summit Mount Everest. A moon rock he carried and a rock he collected from the top of the mountain later flew to the International Space Station. Astronaut Scott Parazynski, STS-120 mission specialist, assesses his repair work as the International Space Station’s solar array is fully deployed in 2007. Duffy and Parazynski will enter the Astronaut Hall of Fame as its 92nd and 93rd honorees, joining the ranks of Alan Shepard, Neil Armstrong, Sally Ride and other celebrated veterans of the Mercury, Gemini, Apollo, Skylab and space shuttle programs. The two comprise the Hall's 15th class of shuttle astronauts to be enshrined since 2001. "I'm incredibly honored to be considered among those who inspired me as a child," remarked Duffy. "I've watched the human space exploration program since I was seven years old and I remember Alan Shepard launching and thinking how cool it was to get on a rocket. Little did I know that I'd have the opportunity to do the same thing." Duffy and Parazynski were selected for induction by a blue ribbon panel of astronauts, flight controllers and journalists organized by the Astronaut Scholarship Foundation. To be eligible for consideration, the astronauts had to have made their first flight 18 years ago (or earlier), be U.S. citizens trained by NASA for commander, pilot or mission specialist roles, and now be retired from the astronaut corps. The Astronaut Hall of Fame opened in 1990 as the idea of the surviving Mercury astronauts. The building that housed the Hall for 25 years closed in November 2015. The new Hall of Fame, to be featured as part of the Kennedy Space Center Visitor Complex's "Heroes and Legends" attraction, is slated to open later this year. Watch videos about Brian Duffy and Scott Parazynski, the 2016 U.S. Astronaut Hall of Fame inductees, at collectSPACE.com.